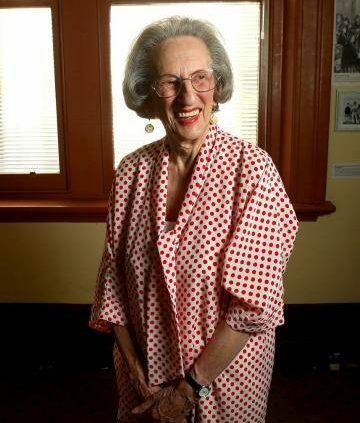 Working class feminist activist Zelda D’Aprano (24 January 1928 – 21 February 2018) was farewelled at a memorial service at the Brunswick Town Hall on March 23rd 2018. 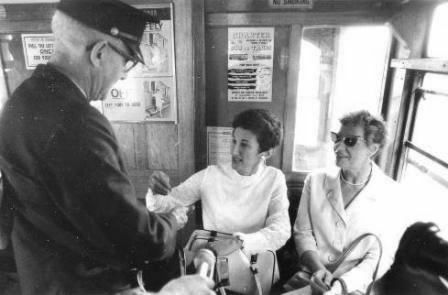 Zelda had a burning passion for equality with a long history of agitating for the rights of women, especially when it came to economic justice. 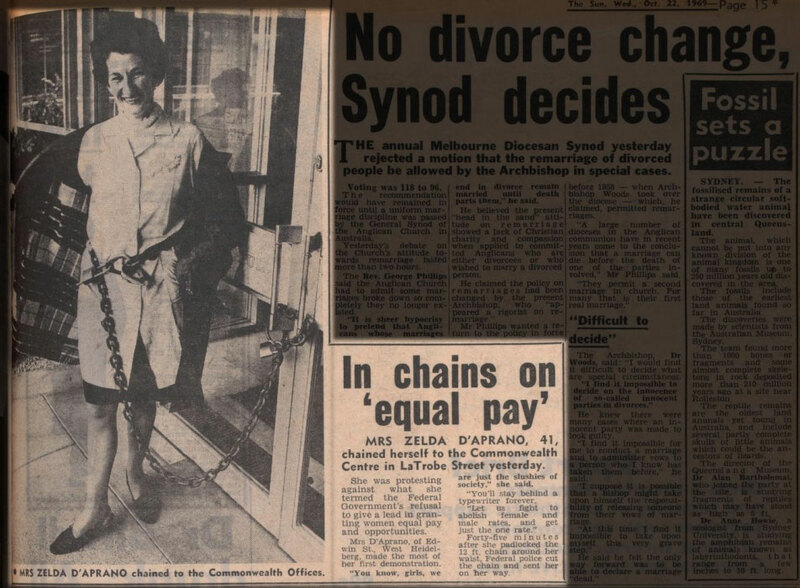 In October, 1969 Zelda famously chained herself to the Commonwealth offices in Melbourne to protest the pay inequity between men and women. Here she is in 2017, talking with Leena van Deventer (VWT Board Member) about fighting for change against the odds and keeping the feminist spirit alive. LEENA: Zelda, much of your work throughout your life has revolved around equal pay and you’ve described it as ‘pay justice’ before. You’ve achieved so much for us but we’ve still got so far to go. What’s your best advice for us to continue what you started? ZELDA: Well, nothing stays the same. Everything changes in some way or another and the situation today, I think, is a matter of survival. Patriarchy is reaching a stage where all they can do is kill each other but while they’re killing each other they’re killing women and children. They create the enemy; they create the wars and I really think we need to need to worry about survival. We just can’t look at equal pay now, that’s not as vital as the campaigning for peace, and is patriarchy capable of producing peace? And I personally don’t think they are. I have lived through several wars at my age and their killing and brutality is as bad as ever, if not worse. Now they’ve got hydrogen weapons and nuclear weapons and that’s the only thing that’s stopping the Holocaust again from occurring. I really can’t see any way forward if patriarchy is in control. I’m not saying that if it was matriarchy that everything would be perfect, because it’s power that corrupts. And whether it’s women in power or males in power, but we haven’t, or not in my time, experienced matriarchy so we can’t really specifically state what would happen. Although, we know it’s power that corrupts but what we are experiencing is patriarchy and that’s what we have to deal with. LEENA: You’ve mentioned before that women need to be more militant in their struggle. Do you still agree with that now that we’re talking about peace and ways to get around it? ZELDA: I don’t think militancy on its own solves the basic problems. 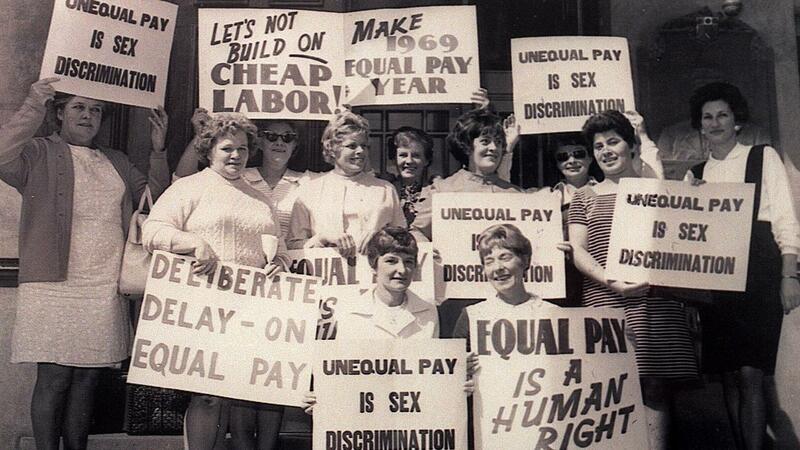 Years ago, women were just so passive and I was very idealistic. I thought, ‘Oh, if women had the power it wouldn’t be like this’. But I know that it’s power that corrupts whether it me female or male. It’s too much power that creates the damage. That’s why patriarchy’s got all the power today and it has had my whole lifetime, let alone what preceded it. And we know that patriarchy’s incapable of producing a peaceful society. LEENA: What are your favourite techniques to avoid burnout? How do we maintain that rage while we are looking after ourselves? ZELDA: [laughs] I was incapable of preventing burnout. And I didn’t know what it was. And two doctor friends told me that I was suffering burnout and that I had to actually change the way I lived because of it. And I really don’t think I ever overcame it and so I never regained that energy, that drive, that desire, the anger, everything that goes with it. I never ever got it back. So as a sufferer from burnout I can only speak of how after all these years the effect is still there. I don’t know, you can’t just judge on what one person experienced, like myself. So I can’t speak for other people but it would be interesting to speak to other women who’ve suffered burnout and find out how they’ve faired eventually. LEENA: Yeah, otherwise if feels like we’re just lining up feminists for the meat grinder instead of helping each other survive and get through it. 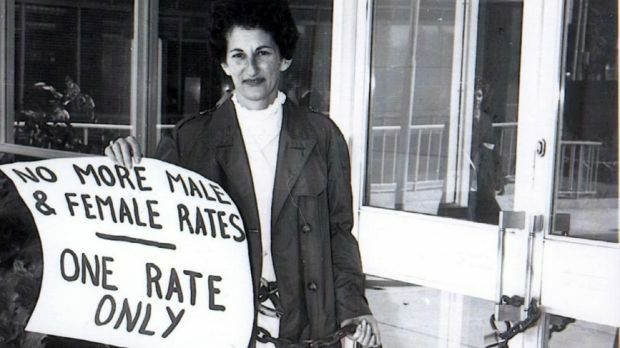 Activist Zelda D’Aprano (right) in 1969 outside Trades Hall in Melbourne. LEENA: What do you think is the glue that holds feminist groups together in the long term? ZELDA: In the long term, I think it’s the injustice done to women that drives them. I mean, it’s there all the time. Things have improved, there’s no doubt about that. But it’s still there. The sexism, smarty comments, presented with humour so you can’t criticise it because you have to see the humour as funny. I do think it’s important to laugh and I do think it’s important to laugh at yourself too and be able to see the humorous side of things. There are always humorous things that happen and we have to be aware of it and enjoy it and continue to be able to laugh. That’s most important. LEENA: Yeah, we can’t just be mad all the time. Though it is a good motivator [laughs]. Leena: But we do need to love each other and laugh sometimes and sleep. LEENA: Otherwise we’d just cry. LEENA: At the moment, gaining a social media following seems to be essential to modern feminist practice, especially for writers. You have to have a following in order to get paid and to do our activism. This has created a kind of ‘celebrity feminism’ trend, which isn’t necessarily new. But with your practice, in particular, you very carefully chose the moments when the spotlight was on you and the times when you were behind the scenes. What are the benefits to being being secretive in your activism? ZELDA: Well, I think there are times when you need to stay quiet for yourself and think. I do a lot of that. I can stay up all night, often I do this, and think about things. Recently, I thought about what I saw on television, not just once but several times, of women and children who are hungry, who are starving, and what can I, as an individual, do about this? And this is what kept me awake, for night after night, thinking about what I can do. And there’s not just one answer to this problem, there’s several answers. One is lack of contraception. Two is religion. I think if we can tackle those two, we would be on the road. LEENA: Some people say ‘termination’. ZELDA: Termination. That’s the word I wanted. Yes, that we refer to it as termination because abortion applies to the foetus whereas termination it’s to the women who are the main person in this. So, that what the language we use has to change. We have all these things where the situation is only going to get worse…there’ll be more starvation, more deaths and it’ll be the undeveloped countries who’ll suffer the most. There’s no doubt about it. LEENA: Does climate change play on your mind in terms of your feminist practice now? ZELDA: Absolutely. If we don’t do anything, life on the planet is going to disappear. I remember years ago, this professor, I think he was, saying it’s reaching a stage where it’ll be too late to turn around. And they carry on as if they’ve still got plenty of time. I don’t know enough about the science because I’m not a scientist to know when this situation reaches a point where you can’t turn around; it’s too late. And I’d like all the scientists to be honest about this situation so that we know where we stand. LEENA: Let’s say you had a magic wand, unlimited funds and a thousand women who would do whatever you wanted them to do at your disposal right now what could we do with them to make an impact regarding gender equality in Melbourne right now? ZELDA: A thousand women. I’d have all of us on the parliament house steps and I would like this to be regular, not just a once-off. So say, every Monday or every Tuesday we will be here and you won’t forget us because you won’t have a chance to forget us because we won’t let you forget. I think more women would be involved in something like that and they’d look forward to it. I have found out when women together carry out their protest, it’s a lovely atmosphere. You feel good and you feel as if you have done something. You go away all feeling very pleased with yourselves and it’s a good feeling but we have do it and, I think, redo it. As I say, even if it’s only once a week, we do it. Whether we do the same things or different things, well that’s what you think at the time. We do have to say ‘We’re still here. Don’t forget us because we’re not going to let you forget us!’ And we’ve got to be positive. Leena: Maybe that sisterhood and that feeling of binding us all together is one of things we can do to stop burnout. LEENA: With other thousand women next you to it’s a lot harder to..
ZELDA: Yes, it’s a wonderful feeling, wonderful feeling, yes. LEENA: Well, thank you so much for your time and your wisdom and all of you work over your entire career. We are completely indebted to you. Thank you. ZELDA: It’s been a pleasure. 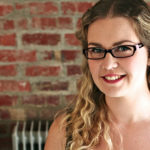 Leena van Deventer is an award-winning writer, game developer, educator and Board Member of the Victorian Women’s Trust. She has taught interactive storytelling at both RMIT and Swinburne University. In 2016, Leena published her first book Game Changers: From Minecraft to Misogyny, the fight for the future of video games with Dr Dan Golding (Affirm Press). Leena is co-founder and Director of WiDGET (Women In Development, Games & Everything Tech), a grassroots intersectional not-for-profit organisation supporting women game developers, with over 550 members.